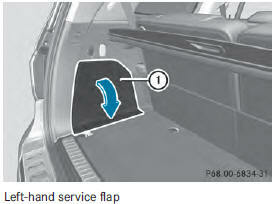 You must open the service flap in the cargo compartment before you can change the bulbs in the brake lamp. ■ To open: release service flap 1 at the top, e.g. with a screwdriver, and swing it downward in the direction of the arrow. ■ Right side: remove the first-aid kit beforehand and pull the parcel net down. ■ To close: reinsert service flap 1. ■ Open the cargo compartment. 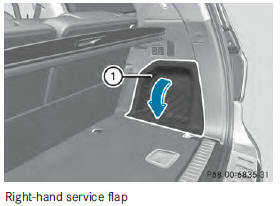 ■ Open the service flap . ■ Turn bulb holder 1 counter-clockwise and remove it. ■ Take bulb out of bulb holder 1. ■ Insert the new bulb into bulb holder 1. ■ Insert bulb holder 1 into the lamp and turn it clockwise. ■ Close the service flap .